It is that service and promise that separates Active Chem-Dry from traditional steam cleaning companies in California. Active Chem-Dry uses no soap. No soap means no sticky or dirt-attracting residue. No dirt-attracting residue means dirt and stains stay gone for good. Active Chem-Dry uses no harsh chemicals whatsoever. The Natural® is a green-certified cleaning solution and is perfect for homes with children and pets. 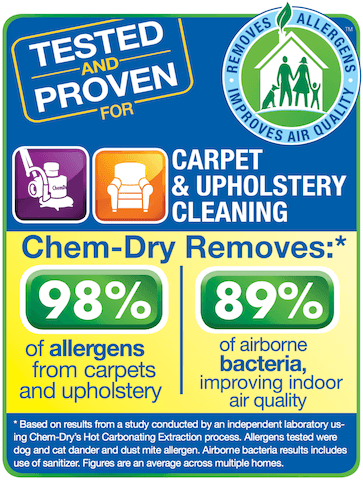 Chem-Dry services have also shown to produce great results for allergy relief and allergen removal. The difference between Active Chem-Dry and local carpet cleaners is clear immediately. Our technicians are friendly and professional. The results are unmatched and the Chem-Dry slogan “Drier. Cleaner. Healthier.” represents the quality customers can expect from our service.